The Young Musician series (books 1 to 4) brings 6 to 8-year-olds (first, second, and third graders) to the exciting world of music making with age-appropriate motivating music and activities. This age group particularly enjoys making new friends and being a part of a musical team. In the group setting they have the opportunity to sing, play musical movement and dance games, experience rhythm with body motions and small percussion instruments, play keyboard/piano solos for each other which helps build their confidence, and work on creative and reading skills with unique multi-sensory projects. The group setting provides the opportunity to play keyboard ensembles which help develop a wider note reading range and a strong feeling for a rhythmic pulse. The class also learns how to orchestrate ensembles and listen for balance between the parts. 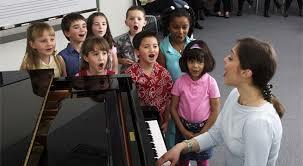 Students are encouraged to develop their creativity through composing projects and lyric writing. This age group also experiences many musical styles and enjoys learning about music history and the lives of the composers.